Councils that bypass the system of checks and balances, forming cliques, often continue their descent of improper behavior, even to the point that they decide to cancel elections. It happened in Garland in 2006. On May 15, 2004, voters from across Garland went to polls to approve council representatives, bond proposals, and Charter changes. One Charter change was to make council member terms two years instead of three. The change was approved by 82.04% of voters across the city. On October 3, 2005, five members of the current city council chose to ignore the change and the overwhelming will of the voters. They refused to call the election that strongly affected all of them except Harry Hickey. For two, Michael Holden and Weldon Bradley, they were reaching their term limits. For two others, Terri Dunn and John Garner, their decision saved them from an election and gave themselves an extra year in office. The history leading to this conflict between the Charter and the personal opinions of five council members was brief but significant. Council will usually discuss if changes need to be made to the Charter following each legislative session to assure the Charter is in line with state law. Several state law changes prompted discussions of creating a Charter Review Committee. Each council member appointed someone to the nine-person committee. During council discussions of what should be sent to the Committee for consideration, Michael Holden suggested changing terms from three years back to two. He said, "There’s a good reason why the legislature elects every other year." This was a surprise to many since voters had changed terms to three-year-terms just three years earlier in 2001. The Committee considered Holden’s recommendation and in a 7-2 vote approved recommending it to the council, only Hickey’s and Jim Dunn’s appointments voting against. Discussions were lengthy as to when the change should take effect. After careful analysis, the committee decided 9-0 to recommend the change begin at the next election, that year in 2004. Whatever way the change was implemented, district terms were to be affected. Some scenarios would have some members that could serve only five years and others would have six years. Other scenarios would force some to serve only one year before having to run again. Only by making the change effective in 2004 could a semi-equitable change-over occur. Every district would have representatives that could serve up to five years before there would have to be a change. There would be no one-year adjustment terms. Holden was an exception to the five-year limit because he was the only one that had served a partial term of less than one year. The Committee recommended several changes to the council, including the term change to two years, at the council work session on February 2, 2004. Lengthy discussion with the committee covered various scenarios and feelings about the change. In a specially-called work session on February 10, the council discussed multiple scenarios among themselves as they sought consensus on what to present or to not present to the voters. In a 7-2 vote on whether to change terms from three years to two, Holden, Bradley, Jackie Feagin, Mayor Day, Sharon Stotts, Mark Monroe, and Randall Dunning voter in favor. Jim Dunn and Hickey voted against. The next question was when to begin the change. Three choices were advanced: 2004, 2005, and 2007. The 2004 choice would require the change at the next election if approved by the voters but would preserve annual elections. The 2005 choice would allow those elected in 2004 to serve three years but would force every district and the mayor to be elected every two years, with the potential that the whole council could turn over at one time. The 2007 change would have preserved annual elections but would have delayed implementation for three years, with the possibility of another Charter review in the interim. The council chose to have the change effective at the election in 2004 by a 5-4 vote. Those voting for the 2004 changeover were: Holden, Bradley, Feagin, Stotts, and Monroe. Those choosing another year were: J. Dunn, Hickey, Day, and Dunning. Significant to the discussions was a caution from then city attorney, Charles Hinton, that such a change would be unfair to those about to file for election whom he felt would be entitled to three-year-terms. The council chose not to follow that advice in their choice of 2004. On February 12, the city attorney sent a memorandum to the council challenging their intent and advising that he thought making the change effective then would be improper. On February 17, 2004, the council unanimously approved an ordinance ordering the question of term limits be placed on the ballot for voter consideration and that the changeover be effective "upon and after May 15, 2004," language drafted by the city attorney. Normally, consideration of an election would not begin until February of the same year. Because there were some declaring they considered themselves elected to three-year terms in 2004 rather than two years, the council considered the question of calling a 2006 election at its October 3, 2005, work session. 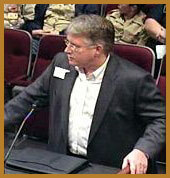 In questioning of the city attorney by Monroe, he stated that the Charter did provide that elections be called in 2006. Five voted to not call the election and four were in favor. Voting against were: Holden, T. Dunn, Hickey, Bradley, and Garner. In favor were: Day, Chick, Monroe, and Dunning. Three of those voting against had previously voted in favor of the ordinance that authorized sending the question to the voters. Seeking an official vote, a public hearing was called for November 15 and after lengthy testimony from citizens, the council again failed to call an election by the same 5-4 vote. A subsequent motion to seek an Attorney General opinion was approved 7-2, T. Dunn and Hickey voting against. The Attorney General would later decline to offer an opinion because of pending litigation on the matter. On December 15, four citizens, one from each of the districts scheduled to have an election in 2006, filed suit in the Fifth District Court of Appeals seeking a writ of mandamus ordering an election. The city council hired outside counsel to represent the five opposing the 2006 Election. In their response to the suit, they argued, among various other things, that the voters had no standing to challenge them and that the matter was not yet "ripe" (that there was still time for them to call an election). On Feb 8, 2006, the court dismissed the suit as not being ripe. Since mandamus requests require expedient action, this action was interpreted by the Let Us Vote! group as a necessary court action under the circumstances and a directive to perfect the case before re-filing. On February 21 and again on March 7, the council held public hearings with extensive public testimony on the question of calling an election. Four consistently voted in favor of elections, Day, Chick, Monroe, and Dunning. Only three of the five that had voted against elections were present at these meetings and each refused to even vote. However, under the City Charter an abstention is recorded as a "no" vote. The March 7 meeting was the last possible meeting to call the election by the state-mandated deadlines. On March 8, Let Us Vote! filed its second suit asking for a writ of mandamus. The next day the court ordered the city to respond within one week. The city did so and the day after that the court ordered oral arguments for March 23, one week later. Before a packed courtroom with several forced to stand, attorneys from both sides presented their arguments and addressed questions from the three-judge panel. On March 24, just two weeks and two days after the suit was filed, the Court granted the writ of mandamus and ordered the city council to call an election no later than July 1. The court said, "… the voters approved an amendment to the city charter providing two-year terms for the mayor and council members and further providing that these term lengths would become effective 'upon and after May 15, 2004.' We conclude this amendment clearly required that individuals elected to the positions of mayor or city council member 'upon or after May 15, 2004’ would serve a two-year term. Under these circumstances, the duty of the city council to call an election in 2006 or city council seats filled in the May 15, 2004 election was 'clearly fixed and required by the law.'" On April 4, the council met in special session and ordered the election for June 17. All present voted in favor. Hickey and Garner were not present.
' We conclude this amendment clearly required that individuals elected to the positions of mayor or city council member 'upon or after May 15, 2004’ would serve a two-year term. Under these circumstances, the duty of the city council to call an election in 2006 or city council seats filled in the May 15, 2004 election was 'clearly fixed and required by the law.'"